Sometimes when you go on holiday, you wish to keep a souvenir, or capture a moment in time in order to commemorate your visit, right? 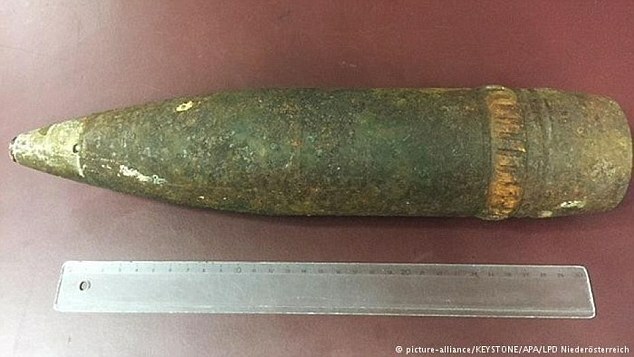 Well, in the case of a female American tourist visiting Vienna, she decided to take with her a WWII artillery shell from Austria, still packed with gunpowder and primed charged all inclusive, so to speak, unlike her holiday. Yes, we suppose the temptation was just too great to not try to bring it home, as the incredibly stupid woman proceeded to hide the unexploded artillery bomb in her luggage. The bomb squad was called in, and Vienna airport was closed and evacuated for 15 minutes in both the arrivals and departures area due to the carelessness of this American tourist. She claimed to have found the WWII bomb during a hike, and had later cleaned of all dirt in her hotel room, before deciding to bring her souvenir home with her. The Austrian customs called the bomb disposal squad, as was reported by Deutsche Welle, in order to remove the potentially hazardous item from her luggage and the airport. The woman was fined $5,000 on the spot, and luckily avoided arrest. Despite the very real threat on their hands, the police told other passengers that they were never really in any danger. Stray WWII artillery could be found in the woods in and around Germany, Austria, France or Poland, but it is not advised to pick them up, and definitely not advised to try and bring them aboard a flight to take home as a souvenir. Seemingly for this woman, owning a piece of WWII memorabilia was just too much temptation to handle, and that landed her in some trouble right at the departure gate. Unbelievable! Don’t try this at home or abroad, kids and adults!